13-10-2012 - Maa ji :( Memory is so important! Posting after such a long time! 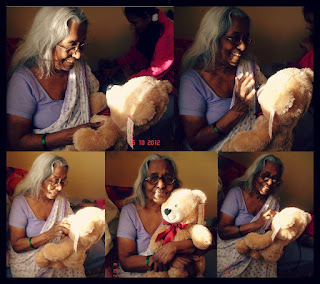 so basically six months have passed already and it's time for my dadi to go back to India! :( so much have had during this time, we have been through SO MUCH - but we have handled all the situations very well! It's soooooooooooooooooooooo sad! Don't know what to do! :( Feeling so low that shes leaving next week! Hopefully *fingers crossed* she will feel better in India because hopefully a lot of people will come to see her and keep her busy!! Gotta think for her rather than how I feel! Sometimes I worry if she will be okay, if people in India will understand her because like most of the time people get frustrated and get angry repeating things over and over again! one needs a lot of patience and time to really understand the pattern a person with dementia has! Like I know when she's sad, she really needs someone to listen to her and hold her while she cries! she needs someone who will then reassure her and tell her that she's forgetting/mixing things up and she shouldn't worry too much and instead think about all the happy things in life! Please GOD, HELP HER! I am not sad that she's leaving, more worried that no one will be able to understand her and she might get more depressed ! I don't want people to blame her and say " oh you forget things and cry on stupid things! you really need to STOP! " because it's just not fair! it's something she believes in truly and proving her wrong just like that using power and anger is just not right! I wish someone will say yes and agree with her and then make some excuse up and make her happy again! I wish someone will actually have that much time for her! "Without memory, we have no foundation, no point of reference from which to learn and grow. 'I'be ability to retain and recall events is one of the essential elements of being human. It is what builds us into people we are"
it's sweet that you care so much for your grandmother. it's hard to watch someone you love fall apart like that but take courage in the fact that she has had a beautiful life and especially, she has people like yourself to care for her and love her.